Howdy & Welcome to 2017! I am excited to announce that I'll be working with the lovely folks at Church & Dwight for my third year as an ambassador. I really am their HUGEST fan when it comes to their OxyClean products... and hey, Batiste Dry Shampoo has been a life-changer for this on-the-go gal. Stay tuned for all the fun, plus a special upcoming February giveaway! The start of the New Year is the perfect time to reflect on the past and look forward to the future. It can also turn into a very hectic time, with the kids going back to school, winter sports starting and work piling up after a few weeks of relaxation. In the past, January has flown by and New Year’s resolutions have quickly flown out the window. This year start the New Year off right, with four simple changes that could turn into GREAT life-long habits! 1. Healthy homemade lunches: Making lunch for your family can feel like a huge chore, but buying lunch regularly is expensive and often leads to unhealthy choices. Start 2017 off right by preparing simple and delicious meals ahead of time. Doing small tasks to prep, such as cutting up vegetables on the weekend, will make the process quick and ensure healthy choices are made during the week. Getting your family involved can also make prepping food more fun and helps your children understand the importance of making healthy decisions. 2. Keep your hair healthy: Washing your hair too frequently can strip out natural oils and cause split ends. This new year, start washing your hair every second or third day to maintain healthy and natural looking locks. Using Batiste™ Dry Shampoo Original between washes will help to eliminate excess oil and grease, leaving hair looking clean and fresh with added body and texture. No water required! 3. Drink water: After a month of indulging, start the year off right by challenging your family to drink more water. Try switching your evening pop, or morning fruit juice, for a large glass of water. This may be difficult for the first few days, but after a week you will feel rejuvenated and have healthier hair and skin. 4. Unplug and recharge: Getting a good night sleep can sometimes be difficult. There are always new emails to be answered and a list of chores to do; however, it is important to understand the need for a good night’s sleep. Sleep can boost productivity, improve your memory and help maintain a healthy weight. This year, try turning off the television, computers and smart-phones one hour earlier. 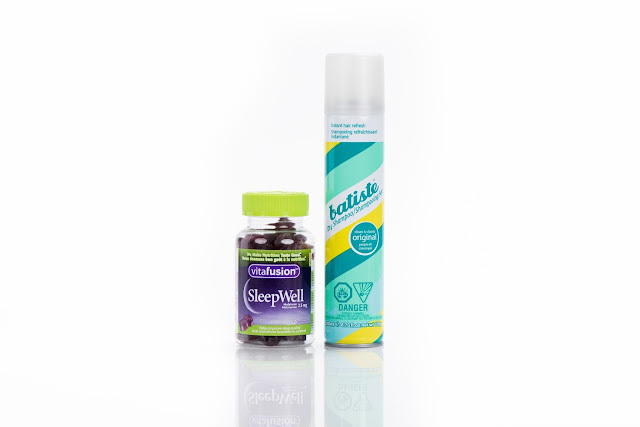 If you are having trouble falling asleep, try Vitafusion™ SleepWell. Each SleepWell gummy is made with 2.5 g of Melatonin, a hormone that helps increase total sleep time. What healthy habits do you want to start this year?